Genuine OEM Epson Ink Cartridge, Magenta, 650 page yield. 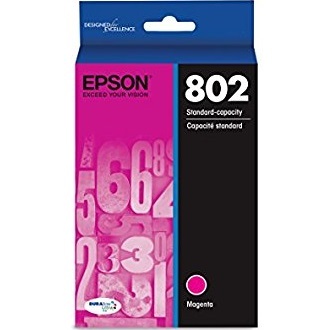 Epson part number: T802320, T802 Magenta. Genuine OEM Epson Ink Cartridge, Cyan, 650 page yield. Epson part number: T802220, T802 Cyan. Genuine OEM Epson Ink Cartridge, Cyan, High Capacity 1,900 page yield. Epson part number: T802XL220, T802XL Cyan. Genuine OEM Epson Ink Cartridge, Magenta, High Capacity 1,900 page yield. Epson part number: T802XL320, T802XL Magenta. Genuine OEM Epson Ink Cartridge, Yellow, 650 page yield. Epson part number: T802420, T802 Yellow. Genuine OEM Epson Ink Cartridge, Yellow, High Capacity 1,900 page yield. Epson part number: T802XL420, T802XL Yellow. Genuine OEM Epson Ink Cartridge, Black, 900 page yield. Epson part number: T802120, T802 Black. Genuine OEM Epson Ink Cartridge, Black, High Capacity 2,600 page yield. Epson part number: T802XL120, T802XL Black. Genuine OEM Epson Ink Cartridge Bundle Pack, 900 (black),650 (color) page yield. Bundle pack includes: one Black (T802120), one Cyan (T802220), one Magenta (T802320), one Yellow (T802420) ink cartridge. Epson part number: T802120-BCS. Genuine OEM Epson Ink Cartridge Bundle Pack, 650 page yield. Bundle pack includes: one Cyan (T802220), one Magenta (T802320), one Yellow (T802420) ink cartridge. Epson part number: T802520-S.